Whenever we travel anymore I seem to find myself with an envelope in tow that, being paper, barely survives the trip. There are so many printouts I need to have on hand, like airline tickets, hotel confirmations, tickets for activities, that really need a more stable home. two pieces of diagonally (or bias) cut cotton fabric, each 9" by 2"
Iron the interfacing onto the back of the two cotton pieces. Accordion-fold the long piece, starting by folding 4 3/4" to the inside, folding the remaining two sections 4 1/2", and ending with 3" unfolded. Press after each fold. Open the first fold back out. Place the outer piece on top, right sides together. Match the edges (the outer piece is longer). 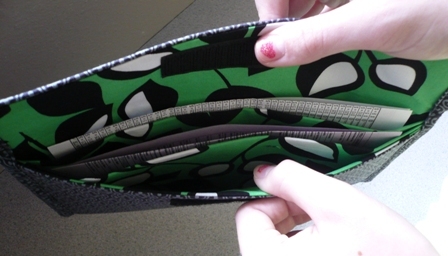 Sew the top and bottom edge with a 1/4" seam. Turn right side out. Press, adjusting folds if needed. 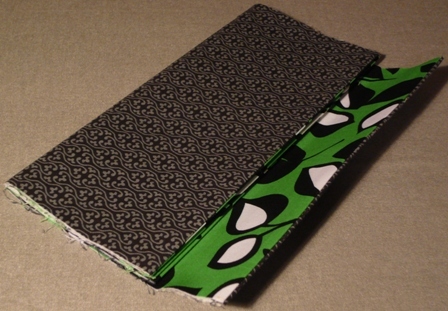 Sew the Velcro on the underside of the flap 1/4" from the edge and on the front of the folder 1/4" from the edge. Open each layer out to sew it on, so you're sewing through only one layer. Fold bias-cut fabric in half. Press. Fold the edges inside to the center. Press. Repeat with the other piece. This is now bias tape. Unfold one side of the bias tape. Fold one short end to the inside 1/4" and press. 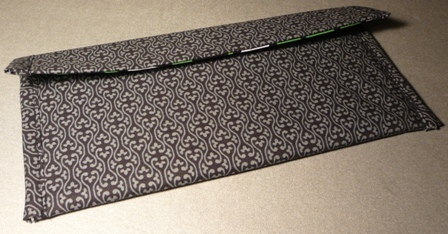 Match the edge to the edge of the folder with the short fold at the top. Trim bias to 1/4" past the bottom edge, then turn that to the inside. Pin in place, then stitch with a 1/4" seam. In the interest of full disclosure, I had to adjust the bottom end and make it shorter as I was sewing. I have trouble with binding. If you're a quilter, you know just how tragic that is. Fold the bias tape to the back along the folds to cover the edge. Stitch close to the inner fold. You're sewing through several layers of fabric, so proceed with caution. Repeat on the other side. You can hand-stitch the open ends of the bias tape closed if you'd like. This has dividers so you wind up with three separate areas for papers. Off to fill it up!